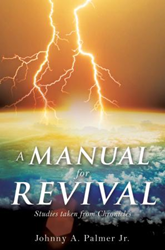 Within the pages of A Manual for Revival ($11.49, paperback, 9781545615461; $5.99, e-book, 9781545619438), believers will learn that the greatest need they have is for a personal revival. Revival is the only hope for America, he adds. Without it, the nation is doomed to degenerate further and further until God's displeasure is release against it. “This book will cause readers to leave hungry to experience a personal revival and to know how to go about having a personal revival,” the author states. Johnny Palmer has written several books, including Double Solitaire With The Trinity: Praying And Playing Your Way To Intimacy With God; Spiritual Survivor Man; Which Messiah Will You Meet? ; GPS-23; Elvis Wellness; A Manual for Revival; Proclamations of a Politically Incorrect Prophet; Hey Jude; Read Limit 30 mph; and Ephesians: A Manual for Survival. Xulon Press, a division of Salem Media Group, is the world’s largest Christian self-publisher, with more than 12,000 titles published to date. Retailers may order A Manual for Revival through Ingram Book Company and/or Spring Arbor Book Distributors. The book is available online through xulonpress.com/bookstore, amazon.com, and barnesandnoble.com.